Primary Sjögren's syndrome (pSS) is an autoimmune disorder characterized by specific pathologic features and the production of typical autoantibodies. In addition, characteristic changes in the distribution of peripheral B cell subsets and differences in use of immunoglobulin variable-region genes are also features of pSS. Comparison of B cells from the blood and parotid gland of patients with pSS with those of normal donors suggests that there is a depletion of memory B cells from the peripheral blood and an accumulation or retention of these antigen-experienced B cells in the parotids. Because disordered selection leads to considerable differences in the B cell repertoire in these patients, the delineation of its nature should provide important further clues to the pathogenesis of this autoimmune inflammatory disorder. Primary Sjögren's syndrome (pSS) represents an idiopathic inflammatory exocrinopathy characterized by both organ-specific autoimmunity, preferentially affecting the salivary and/or lacrimal glands, and systemic manifestations. The characteristic hallmarks of pSS are focal lymphocytic infiltrates and subsequent destruction of the lacrimal and salivary glands, resulting in keratoconjunctivitis sicca and xerostomia. In addition, there is a broad variety of accompanying clinical and laboratory manifestations, emphasizing that pSS is a systemic disorder . In most patients, these laboratory parameters include hypergammaglobulinemia, circulating immune complexes and autoantibodies, such as those against the Ro-SSA and/or La-SSB autoantigens and rheumatoid factors. The typical production of autoantibodies and polyclonal hypergammaglobulinemia indicates that abnormalities of humoral immunity are significant in pSS and have been included in the classification criteria . However, the factors driving autoimmunity and leading to the differentiation of autoreactive lymphocytes into autoantibody-producing plasma cells remain largely unknown, although several epitope mapping studies have suggested that autoimmunity in pSS is driven by autoantigens. The glandular infiltration in pSS is composed mainly of CD4+ T lymphocytes  but usually also contains a substantial number of B cells and plasma cells [4, 5]. The degree of glandular destruction and symptoms of dryness do not seem to be directly related to the number of infiltrating lymphocytes. Indeed, the mechanism of glandular damage remains incompletely delineated, although a role for CD4+ T cells has been proposed, either directly or through the action of secreted cytokines. Although local autoantibody production in the glands has been suspected and autoantibodies have been found in the saliva , the pathogenetic role of the glandular B lymphocytic infiltrates remains largely unknown. In this regard, it is notable that autoantibodies to the M3 type of the muscarinergic acetylcholine receptor might function to inhibit salivary flow (reviewed in ) in a manner comparable to the antibody-mediated blockage of nicotinergic receptors in patients with myasthenia gravis. Cell clusters resembling germinal center (GC)-like structures have been reported in the focal lymphocytic sialadenitis of the minor (labial) salivary glands in patients with pSS , although it is not known whether they function completely as lymphoid GCs. Because similar ectopic GC-like reactions have also been observed in the synovium in rheumatoid arthritis (RA) [8, 9] as well as in a variety of other diseases (such as spondylarthopathies, myasthenia gravis and thyroiditis), it has been proposed that such potentially functional B cell aggregates can be induced in several extrafollicular tissues in autoimmune disorders [4, 8–10]. The formation of these aggregates seems to be clearly dependent on the interaction of chemokines and their receptors [10–12]. In patients with pSS the salivary and lacrimal glands are the main target organs for the immune system and, at least in part, subsequent autoimmune-mediated tissue damage. Local production of cytokines by mononuclear cells and also epithelial cells might contribute to the immune-mediated destruction of exocrine glands in pSS . pSS has therefore also been called 'autoimmune epithelitis' , emphasizing that epithelial cells are thought to be important in the immunopathogenesis. Several cytokines have been demonstrated in inflamed tissue by using reverse-transcriptase-mediated polymerase chain reaction technologies as well as in animal models. Cytokines, such as tumor necrosis factor (TNF), lymphotoxin α (LTα) and interleukin (IL)-1β have been found to influence the destruction of the acinar structure in human salivary gland cell clones . The most prominent cytokines detected in affected salivary glands of patients with pSS are IL-1, IL-6, IL-10, transforming growth factor (TGF)-β, interferon (IFN)-γ and TNF. Fox et al. found that salivary gland CD4+ T cells produced over 40-fold more IL-2, IFN-γ and IL-10 than peripheral-blood CD4+ T cells from patients with SS or from controls. Moreover, salivary gland epithelial cells produced 40-fold more IL-1α, IL-6 and TNF mRNA than epithelial cells from individuals with histologically normal salivary glands. It has therefore been suggested that T helper type 1 (Th1) cytokines, such as IFN-γ and IL-2, as well as IL-10, IL-6 and TGF-β, might be important in the induction and/or maintenance of pSS , whereas Th2 cytokines, detected in some cases in association with a striking B cell accumulation in the labial salivary glands, might be involved in the progression of the disease. Furthermore, it has been suggested that TGF-β, an important immunoregulatory cytokine whose absence can lead to systemic autoimmune disease , might be deficient in SS. In this regard, reduced levels of TGF-β have been found in SS glands with intense lymphocytic infiltrates . Furthermore, mice that fail to express TGF-β develop an exocrinopathy resembling SS . Although several studies have analyzed cytokines that seem to be involved in the pathogenesis of SS, reports on cytokine polymorphisms are very limited and do not allow any firm conclusion. It should be noted that the interaction between epithelial cells and infiltrating T cells has been characterized in detail, but the cytokines involved in local B cell activation remain largely unknown. The infiltration of lymphocytes into glandular aggregates apparently has a crucial role in the tissue pathology of SS. This process seems to be tightly regulated at least in part by chemokines and the local expression of their receptors. Chemokines and the expression of chemokine receptors by the inflamed tissue as well as by lymphocytes are therefore likely to be of importance in the evolution of tissue pathology in pSS. Mice deficient in lymphoid-homing chemokine receptors CXCR4 and CXCR5 lack normal lymphoid organs [19–21], indicating that these receptors as well as the chemokines CXCL12 (stromal cell-derived factor 1; SDF-1) and CXCL13 (B-cell-attracting chemokine 1; BCA-1) are important for lymphoid organogenesis. In addition, studies in CXCL13 transgenic mice found that this chemokine, together with TNF and LTβ, is crucial in lymphoid organogenesis, whereas the LTβ knockout mouse lacks the formation of GC structures. A recent review reported that CXCL13 (BCA-1), CCL19 (ELC), CCL21 (SLC) and CXCL12 (SDF-1) all contribute to lymphoid homing and to the persistence of chronic inflammation in pSS . Moreover, studies on RA demonstrated that CXCL12  and CXCL13  are involved in the formation of GC in the rheumatoid synovium. Thus, recent studies have shed light on factors involved in directing lymphocytes into inflamed tissue and maintaining inflammation in SS, whereas the etiologic factors of SS remain to be delineated. Of potential importance is the fact that enhanced levels of B lymphocyte stimulator (BLyS; also known as B cell activating factor belonging to the TNF family [BAFF] or transmembrane activator and CAML interactor [TACI]) have been demonstrated in patients with SS , levels that are higher than previously identified in systemic lupus erythematosus (SLE) . In addition, expression of BLyS has been found to be markedly enhanced in the inflamed salivary glands , indicating that activation of B cells might take place in the parotids. In this regard, it is notable that BLyS transgenic mice develop SS with age after the development of manifestations of lupus. Autoantibodies are features of most systemic autoimmune diseases, including pSS. The production and persistence of autoantibodies in autoimmune conditions is considered to occur because of immune dysregulation with a resultant break in tolerance, regardless of whether these autoantibodies are pathogenic . Despite intensive work on the characterization of autoantigens, the cellular basis of their production and the strong association of certain autoantibodies with particular MHC class II alleles, and despite increasing knowledge about tissue B cell immunology and the role of cytokines and chemokines, little is known about the usage of IgV genes in autoimmune conditions and about the respective autoantibodies. The observation that certain autoantibodies are frequently encoded by a limited number of IgV gene segments suggested that biases in the development of the B cell receptor repertoire might have a role in the tendency of specific individuals to develop these autoantibodies. Whether the usage of these specific gene segments is different in normals and patients with systemic autoimmune disorders remains controversial. Recent approaches have made it possible to address this issue and to estimate the differential impact of molecular and selective influences in shaping the IgV gene repertoire in normals and patients with autoimmune diseases, including those with pSS. Previous analyses of autoimmune B cells focused almost exclusively on productive V gene rearrangements and therefore could not discern the impact of molecular and selective influences. Analysis of the nonproductive repertoire is especially important to assess the immediate impact of molecular processes, such as recombination and somatic hypermutation [26–32], because the nonproductive rearrangements do not encode an expressed Ig molecule and are therefore not influenced by selection. In contrast, the distribution of B cells and their productive IgV gene rearrangements can be influenced by a variety of selective events during development and subsequent antigenic stimulation because of the nature of the expressed heavy and/or light chain and the cognate (auto)antigen. Recent analysis of the nonproductive V gene repertoire in patients with pSS and SLE has documented minimal abnormalities in the nonproductive VH, Vκ and Vλ gene repertoires [33–41]. Although only a few patients with pSS and with SLE have been analyzed with this approach to assess the overall repertoire, the data indicate that IgV gene usage in the nonproductive repertoire is not significantly different from normal, suggesting that the basic process of IgV gene recombination is largely normal in patients with these autoimmune diseases. This does not rule out the possibility that abnormalities in the usage of specific VH or VL genes might contribute to autoimmunity. However, it is apparent that there is unlikely to be a generalized abnormality in V(D)J recombination in these autoimmune diseases. A study by de Wildt et al. confirmed on the mRNA level that the IgV gene usage in patients with SLE or mixed connective-tissue disease (MCTD) was comparable to normal. Moreover, the large number of VH genes that encode specific autoantibodies make it unlikely that an abnormality of V gene usage underlies autoimmunity in most patients. Although there is no conclusive evidence for recombination biases predisposing to systemic autoimmunity in SLE and SS, there are some exceptions. In some circumstances, specific autoantibodies express marked biases in IgV gene usage. One example is the almost exclusive usage of VH4–34 in cold agglutinin disease . In addition, the 16/6 idiotype expressed by some anti-DNA antibodies is encoded by VH3–23 and the 9G4 epitope encoded by VH4–34 is over-represented in anti-DNA antibodies in SLE. In these instances, autoantibodies preferentially employ specific VH genes for the variable regions. Despite the apparent increase in the use of these specific genes, the generalized higher frequency of somatic hypermutation, abnormal patterns of targeted mutations toward specific DNA motifs, indications of increased receptor editing and differences in the entire IgV gene repertoire of peripheral B cells from patients with SLE [34, 35, 37, 44] indicate that broad abnormalities in B cell selection are characteristic of SLE. B cell repertoire abnormalities are therefore not restricted to clones of autoreactive B cells in this autoimmune disease. A recent study  demonstrated that VH4–34 is clearly negatively selected among post-GC B cells in normals, as already shown at the single-cell level for peripheral B cells  and post-switch tonsilar plasma cells . By contrast, patients with SLE do not negatively select these cells appropriately in their GC, allowing their expansion after encountering antigen and receiving help from T cells. An enhanced frequency of VH4–34 has previously been observed in peripheral plasma cells of a patient with active SLE . This contrasts markedly with the normal post-switch plasma cell repertoire, in which VH4–34 is strictly excluded . This finding is consistent with the conclusion that disturbances in selection have a key role in SLE. Notably, different autoimmune diseases, such as pSS and SLE, seem to have characteristic abnormalities of particular censoring mechanisms. Distinct abnormalities in the B cell repertoire have been identified in pSS. Recent studies in three patients with pSS found that major abnormalities were related mainly to influences of selection, because the usage of VH and VL gene segments in the nonproductive repertoire was largely normal. However, significant abnormalities were found in the productive repertoires, especially by affecting VL distribution [36, 37]. Notably, four Vλ genes (2A2, 2B2, 2C and 7A) represented 56% of all functional Vλ joints . In the productive Vκ repertoire, three Vκ genes (L12, O12/O2 and B3) comprised 43% of all amplified VκJκ joints . It is of interest that VκA27, a gene frequently employed by autoantibodies, rheumatoid factor and lymphomas in SS, was found less frequently in the peripheral nonproductive repertoire of the patients with pSS than in normal controls (8% versus 14%; P < 0.05). By contrast, this gene was found at an increased frequency in the parotid gland (29%) compared with the blood (8%; P < 0.05) in the one patient examined . Moreover, 2 of 15 VκA27–Jκ5 rearrangements found in the parotids were clonally related . Furthermore, 11 clonally unrelated VκA27–Jκ2 rearrangements representing 34% of all productive Jκ2 using rearrangements were found in the parotid. Accumulation or local expansion of B cells expressing VκA27–Jκ2 rearrangements in the parotid glands seems to be a characteristic of pSS. Receptor editing is a mechanism by which B cells are able to escape deletion by revising their autoreactive receptors. To the best of our knowledge, there are no reports addressing the role of editing in SS, whereas several studies did so for SLE. Formerly it was thought that expression of the IgB cell receptor (BCR) extinguished subsequent Ig rearrangements by downregulating the expression of recombination activating gene (RAG) 1 and RAG2 enzymes in the bone marrow. However, recent studies provide evidence that immature B cells outside the bone marrow [9, 47, 48] retain RAG activity and can therefore replace their receptors by secondary Ig gene recombination (receptor editing/revision). This is noted with increased frequency in secondary lymphoid organs [9, 46, 47, 49] and in the fetus . The extent to which the presence of recombination enzymes is correlated with actual editing is uncertain. There is a controversy over whether defects in receptor editing or secondary rearrangements are involved in shaping the B cell repertoire in autoimmunity. The possibility that deficiencies in central or peripheral receptor editing could have a role in generating autoimmunity has been suggested . In addition, analysis of autoreactive hybridomas  generated from patients with SLE demonstrated an overusage of J-proximal Vκ1 genes and a preferential use of J elements proximal to Vκ, suggesting that receptor editing in SLE might be defective, because skewing towards the usage of Jκ, distal Vκ genes and Jκ5-expressing V gene products [9, 34, 53] has been taken as an indication of active receptor editing. Because receptor editing at the VL loci is thought to have a major role in rescuing autoreactive B cells from deletion , defects in receptor editing could have a role in the etiology of SLE [25, 34, 35, 49–52]. Recent studies in patients with RA [9, 54, 55] provided evidence that receptor editing/revision might also be more active in the synovium of these patients than in normals. In contrast with these patients with RA, patients with pSS seem to have decreased receptor editing/revision, as identified by an enhanced usage of V-proximal JL segments. It is possible that this reflects a defect or infrequent usage of receptor editing in pSS [36, 37, 39]. In this regard, a recent analysis of six monoclonal antibodies with rheumatoid factor activity obtained from the peripheral blood of patients with pSS showed that all used Vλ-proximal Jλ2/3 gene segments , which is consistent with the conclusion that receptor editing/revision might be defective in pSS. The role of abnormalities in this mechanism in permitting the emergence of autoimmunity remains to be fully delineated. As already mentioned, recent studies [36–41] addressed the question of whether there are differences in the IgV chain gene repertoire of CD19+ B cells by comparing two immune compartments, the peripheral blood and the inflamed parotid gland, a target tissue in pSS. Although only one patient was analyzed, the data obtained provide new insights into this disease. The underlying assumption of this study was that the peripheral circulating B cell repertoire reflects a complex group of cells expressing IgV genes that might have been influenced by a variety of immune compartments, whereas the IgV genes of B cells infiltrating the parotid might provide a more skewed population owing to the local selection and/or (antigen-dependent) proliferation. Alternatively, inflammation might have induced the migration of polyclonal B cells into the affected tissue [40, 56–58]. Whereas clonal B cell expansions in the target tissues of SS patients are well established [4, 5] and early studies examining anti-idiotypes have suggested that B cell infiltrations in pSS represent a highly selected population , a molecular analysis of 37 Ig heavy chain rearrangements from labial salivary gland biopsies in pSS  has shown a rather polyclonal pattern of IgV gene usage, comparable to that of circulating B cells from normals. Thus, the lack of direct comparison between the B cell repertoire in the blood and that in the parotids has prevented the drawing of firm conclusions about the extent to which selective pressures influence the repertoire in autoimmune diseases with characteristic extrafollicular germinal centers, such as pSS. With the exception of the VH7 family, a single gene family that is known to be related to an insertion/deletion polymorphism of the human VH locus , members of all VH families were found in the patient's peripheral blood as well as in the parotid gland. Notably, however, there were specific differences in the VL gene repertoire when blood and parotid were compared . Strong selective influences were detected in the parotid gland of the patient in that B cells with rearranged VκA27, VκA19 and Vλ2E as well as Vλ1C were markedly enriched. Furthermore, there was evidence of clonal expansion of VκA27–Jκ5 and VκA19–Jκ2 rearrangements in the patient's parotid gland as well as of Vλ1C–Jλ3 rearrangements in both blood and parotid gland. An increase in VκA27 preferentially rearranged to Jκ2 but not clonally related in the gland is noteworthy because there was a significantly lower frequency of VκA27 in the periphery of patients with pSS compared with normals. These data are consistent with the conclusion that there is clonal expansion within the salivary gland B cells as well as the selection of cells expressing particular light chains. In addition, a polyclonal population of B cells was present. Positive selection of particular VL chain genes by foreign antigens or autoantigens present in the gland seems to shape the productive VL chain repertoire in the inflamed tissue. This is in contrast to the VH repertoire of the patient analyzed, which was similar in the peripheral blood and in the parotid gland. These results suggest an important role for VL chain gene usage in the immune activation of B cells within the parotid gland of the pSS patient studied. A restriction of the VL chain repertoire has been described after vaccination. As an example, antibodies against Haemophilus influenzae (Hib) B that develop as part of a TH2 response have been identified as being frequently encoded by VκA2, O8/O18, L11, A17 and A27 . Moreover, Vλ genes of the Vλ2 and Vλ7 family were found in the Hib-antibody VL gene repertoire . In addition, VκA27 and Vλ2C, 2E, 2A2 or 10A were also shown to encode antibodies against Streptococcus pneumoniae. Interestingly, VκA27 and Vλ2E, which were frequently found in the parotid gland of this patient, with VκA27 expanded clonally, have also been shown to encode antibodies against rabies virus . Thus, microbial antigens, including bacterial and viral epitopes that could be involved in the pathogenesis of pSS, might also be involved in the selective processes shaping the VL gene repertoires of B cells accumulated in the parotid gland of this patient with SS. In contrast, it is possible that autoantigens might be involved in the accumulation of parotid gland B cells in this patient. In this regard, VκA27 was frequently used by rheumatoid factors in patients with RA . Rheumatoid factor is typically present in the sera of patients with pSS and was also detected in the saliva or in salivary gland biopsies  of these patients. In this regard, Martin et al. described two salivary-gland lymphomas that developed in patients with pSS from rheumatoid-factor-specific B cells. Moreover, VκA27 has been reported to be frequently employed by lymphomas developing in the salivary gland of patients with pSS . Despite the presence of clonally expanded B cells expressing VκA27, the patient studied did not develop lymphoma during a follow-up period of 3 years after the examination, indicating that additional factors or further persistence of the chronic B cell proliferation are essential for the development of lymphoma. In the peripheral-blood B cells of patients with pSS, less than a third (28.3%) of the CD19+ B cells expressed somatically mutated productive VH rearrangements . The frequency of mutations was lower than that previously reported for circulating CD19+ B cells of normals (1.4 versus 2.6%; P < 0.001) [26, 28]. Although a direct comparison of B cell subsets was not performed at the beginning of these analyses, decreased levels of memory CD27+ B cells in patients with pSS probably account for the difference in mutations [39, 40]. By contrast, the vast majority (about 80%) of the parotid B cells used mutated VH rearrangements, and both the nonproductive and productive glandular rearrangements exhibited significantly increased mutational frequencies compared with the blood counterpart. Because mutated IgV genes are characteristic of memory B cells , this finding indicates an accumulation of memory-type B cells in the inflamed parotid gland. The mutational frequency and the percentage of mutated light-chain genes were also greater in the productive VL chain rearrangements of B cells from the parotid gland than in cells from the peripheral blood, but the VL rearrangements accumulated a large number of silent mutations. Interestingly, productively rearranged Vλ genes from the parotid gland (3.32%) exhibited a significantly greater mutational frequency than the Vκ gene rearrangements (2.35%; P < 0.001) . Because GC-like structures have previously been described in the parotid gland [3, 4], this site might be able to act as a secondary lymphoid organ facilitating somatic hypermutation and selection of antigen-specific B cells. Antigen-driven germinal-center reactions might proceed within ectopic lymphoid follicles in the parotid gland, giving rise to highly mutated antigen-specific B cells. However, the migration of highly mutated antigen-specific B cells from the patient's blood to the parotid gland could also contribute to the observed differences in the mutational frequencies. The analysis of the replacement/silent (R/S) ratio and the mutational 'hot spots' of productive VL chain rearrangements of peripheral and parotid gland B cells revealed no major abnormalities when compared with normal donors, indicating intact selective mechanisms with selection against R mutations in the frame work regions that might cause structural constraints of the Ig molecule. In the productive VL chain repertoire of B cells from the parotid gland, we found the frequency of S mutations to be increased, which was consistent with a reduced R/S ratio in the complementarity-determining regions (CDRs) [38, 39]. This is in accordance with the observations of other studies (Gellrich et al., Stott et al. and Miklos et al.). Stott et al. described a decreased R/S ratio in the CDRs of VH and VL gene rearrangements of B cells obtained by minor salivary-gland biopsies from two patients with SS. Detailed analyses of the frequency of the distribution of mutations revealed that mutations in nonproductive VL rearrangements of B cells from the parotid gland were less targeted towards the highly mutable RGYW [R(purine)/G/Y(pyrimidine)/W(A or T)] motifs. However, these targeted mutations of RGYW in VL gene rearrangements were highly selected in B cells from the parotid gland. Although no firm conclusion can be drawn, it is possible that these targeted mutations are generated in the parotids of the patient, with retention of particular mutated VL rearrangements. Remarkably, the productive glandular VH rearrangements, but not VL rearrangements, were found to exhibit a significantly shorter CDR3 region than their peripheral productive counterparts [38, 39]. To a considerable extent, this was accounted for by a less frequent usage of the JH6 segment in the glandular rearrangements when compared with the patient's peripheral repertoire as well as with that reported previously for normals [27, 28]. It is noteworthy that the JH6 segment encodes the longest CDR3 component (29 nucleotides) of all JH genes and can thereby contribute to rearrangements with longer CDR3 regions. This confirms conclusions that JH6 is positively selected in the expressed preimmune repertoire  but negatively selected in the mutated repertoire. Moreover, selective influences on productive rearrangements seem to favor shorter CDR3 regions [27, 28]. The finding of VH sequences with shorter CDR3 regions is in accordance with the conclusion that memory B cells that accumulate in the parotids are recruited by antigen. The CDR3 region of VH rearrangements might be more important in reacting to parotid antigens than other regions of the VH molecule. The major salivary glands are known to be the site of preferential B cell expansions and in some cases of lymphoproliferation in pSS. B cells from the parotid gland have been identified as a distinct population showing preferential expansion and somatic mutation of particular VL chain rearrangements, such as VκA27–Jκ5, VκA19–Jκ2 and Vλ1C–Jλ2/3, in comparison with peripheral B cells . Clonal expansion was not associated with any evidence of intraclonal diversification. Thus, this glandular expansion might be derived from proliferation of the very small subset of proliferating mantle-zone (founder) B cells or from an early state of dark-zone germinal center cells . However, it is uncertain whether these cells are able to leave the germinal center. Accumulation of memory-type B cells in the inflamed parotid gland supports the conclusion that there is an enhanced influx/homing of particular memory-type B cells into the inflamed gland, rather than a proliferation of a few founder B cells entering the parotid GC structures in patients with pSS, despite evidence of clonally expanded B cells in the tissue. Several groups, including our own, have performed studies on the distribution of peripheral B cell subsets in systemic autoimmune diseases, such as SLE and pSS [33, 40, 57, 72]. In this regard, the identification of CD27 as a marker of memory B cells [33, 68, 73, 74] made it possible to characterize peripheral naive (IgM+/CD27-) and memory (CD27+) B cells. Interaction of CD27 with its ligand on T cells, CD70, serves as a pathway of differentiation of B cells into plasma cells [73, 75, 76]. Recently, homotypic interaction of CD27 and CD70 expressed by B cells only  was also reported to be sufficient for B cell differentiation, raising the possibility that B cells might be able to regulate themselves by CD27–CD70 interactions. In another recent study  it was shown that CD27- B cells can be differentiated into IgG-producing or IgE-producing plasma cells in vitro. It needs emphasis that class switching, but not somatic hypermutation, could be induced, although the recently discovered activation-induced deaminase (AID)  has been found to be expressed in these cells. On the basis of the available data on the distribution of B cell subsets in SLE versus pSS, there is increasing evidence that diseases associated with immunologic activity can be characterized by unique features of B cell distribution [33, 72, 80–83]. Whereas patients with active SLE  revealed increased circulating CD27+ memory B cells, reduced naive CD27- B cells and markedly increased CD27high plasma cells that seemed to be related to lupus disease activity, analysis in pSS  showed a clear predominance of CD27- naive B cells (Fig. 1) that also lacked expression of CD5 compared with normal donors as well as patients with SLE (P < 0.001) and a significant decrease in the frequency of memory CD27+ B cells that were predominantly CD5+. The reduced frequency of CD27+ B cells in pSS was significant when compared with either normal controls (P < 0.05) or patients with SLE (P < 0.0002). Another recent study  characterized peripheral B cells in 11 patients with pSS as well as patients with RA and normal controls. These investigators also found a predominance of naive B cells that were CD27- and a reduced frequency of memory B cells in patients with pSS. Analysis of the distribution of peripheral CD19+ B cell subsets demonstrates that patients with primary Sjögren's syndrome (pSS) have reduced frequencies of CD27+ memory B cells in the peripheral blood compared with normal donors. In addition, patients with pSS with secondary non-Hodgkin lymphoma exhibited an increase in CD27+ B cells in the blood. The difference between pSS and SLE (Fig. 2) is noteworthy because of the many common clinical and serologic similarities (hyperimmunoglobulinemia, positive anti-Ro and anti-La autoantibodies, rheumatoid factor) between patients with pSS and those with SLE. Another difference between patients with pSS and with SLE was the normal peripheral B cell count in the former, whereas patients with SLE exhibited significant decreases in peripheral B cell frequencies [33, 40]. In one study , patients with RA also manifested an increased frequency of CD27+ memory B cells and a normal frequency of CD27- naive B cells. The pattern of B cell subpopulations in pSS, RA and SLE defined by CD27 expression therefore seemed to be unique. 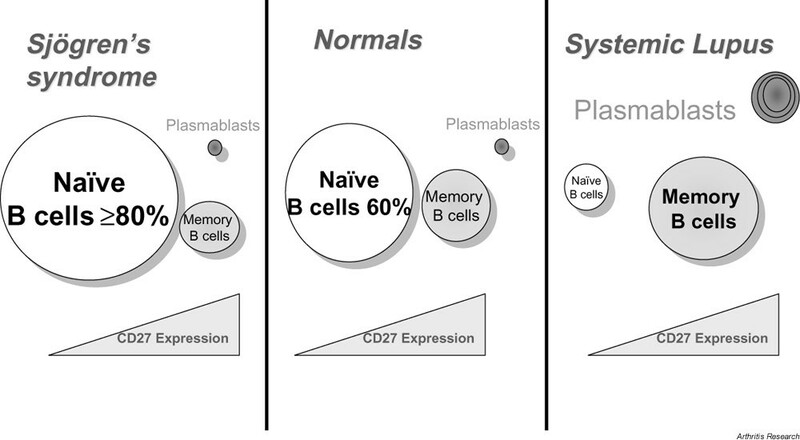 Schematic distribution of B cell subsets in peripheral blood of normals compared with patients with systemic lupus erythematosus and Sjögren's syndrome. Previous data have shown that the frequency of CD27+ B cells reflects the accumulation of antigen experience of an individual that is, at least in part, related to age [73, 82]. Cord blood and blood from hyper-IgM patients normally do not contain CD27+ B cells . Because of the usually more advanced age of patients with pSS than of those with SLE, the actual differences identified between the SLE and pSS groups might have been underestimated. In contrast, the peripheral status of B cell distributions looks very similar in patients with pSS and in those with HIV with predominantly naive B cells [40, 80]. Because CD4+ T cells are depleted in HIV but not in pSS, one interpretation of these observations may be that T cell dependent priming of B cells might be less in patients with pSS than in normals and patients with SLE. Remarkably, the CD27- B cells could be further subdivided by the mutational status of their productive VH rearrangements into a majority of naive cells (35 of 39 with no mutations; mutational frequency less than 0.1%) and a minority of memory-type cells (4 of 39 with mutations; mutational frequency 4.6%), whereas all but one of the CD27+ B cells (31 of 32) analyzed expressed mutated IgV genes . Currently, the finding of the small population of CD27- B cells expressing mutated VH rearrangements remains unclear. It is noteworthy that this population had a significantly lower mutational frequency than CD27+ B cells (4.6% versus 7.8%; P = 0.0009). Possible explanations might be transient or low-level CD27 expression, shedding of CD27, or stimulation that results in mutations but fails to upregulate CD27. Notably, however, there are no striking differences in the frequency of this population between SS patients and normals , and, very recently, this population has also been detected in other normal and abnormal conditions by studies on single cells. Importantly, the regulation of CD27 and its association with the acquisition of IgVH mutations seems to be normal in patients with pSS. Previous molecular analysis documented that CD27 can be taken as a reliable marker for memory B cells in healthy normals [68, 74] as well as in patients with SLE . The analysis of a patient with SLE revealed a mutational frequency of 0.4% in the CD27- B cells and 6.1% in the CD27+ B cells. Overall, there was no major difference in the frequency of mutations in VH rearrangements of CD27- and CD27+ B cells, respectively, obtained from patients with pSS or SLE and from normals, which is consistent with the conclusion that expression of CD27 indicates previous antigen contact by the respective B cell. Several studies have identified an enhancement of CD5-expressing B cells in the periphery of patients with pSS [84–87], although to the best of our knowledge no study has analyzed in detail the proportions of CD5+ B cells among naive and memory B cells. In contrast, a few reports did not identify an enhanced frequency of CD5+ B cells in pSS . Earlier studies  found enhanced frequencies of CD5+ B cells in about half of patients with pSS, as well as in about half of patients with RA and about a quarter of patients with SLE and normals. By contrast, there was an increase only of CD5-/CD27- naive B cells in patients with pSS , whereas there was no significant increase in the overall CD5+ B cell population. However, a subgroup of seven patients with pSS with the highest frequencies of naive B cells (86–94%) also had larger numbers of CD5+/CD27- naive B cells (14.2–37.2%). In the patients analyzed, there were no clinical features that distinguished these seven patients with enhanced CD5+ B cells from the remainder. These data indicate that the previously known enhancement in CD5+ B cells in SS stems preferentially from an increase in the immature B cell pool. It should be noted that B cells infiltrating the parotids frequently express CD5, further supporting the hypothesis of homing and activation of specific B cells in the glands. In contrast to the focal sialadenitis of the minor (labial) salivary glands, the lymphocytic lesions of the major salivary glands often contain secondary lymph follicles. B cells have been shown to infiltrate the glandular duct epithelium and thereby to contribute to the characteristic pattern of chronic lymphocytic inflammation called myoepithelial sialadenitis (MESA) or benign lymphoepithelial lesion . These lesions are thought to form the substrate for the development of extranodal non-Hodgkin lymphomas (NHLs) [91, 92]. In this context, it is well known that patients with pSS have an increased risk of developing such lymphomas compared with normals. Extranodal lymphomas in pSS are almost exclusively of B cell origin and are frequently identified in the major salivary glands. Recently, the suggested linkage between autoimmunity, autoantibody-producing cells and lymphoma [66, 93, 94] has been emphasized by the demonstration of two cases of parotid gland lymphomas in pSS producing mono-specific rheumatoid factors . A remarkably biased usage of individual VH segments (in particular the VH1–69/DP-10 and VH3–07/DP-54 segments) has been shown in both benign and malignant clonal B cell expansions in the salivary glands of patients with pSS, exhibiting some evidence for (auto)antigen selection, for example by rheumatoid factor activity [4, 58, 66, 95, 96]. Moreover, a previous anti-idiotypic study has suggested that B cells expressing VH1–69/DP10 cross-reactive idiotypes G6, G8 and H1 are increased in infiltrates in the minor salivary glands of patients with pSS . Support for a role of B cell activation in the development of lymphoma comes from phenotypic analyses of peripheral B cells in patients with pSS that demonstrated an enhanced frequency of CD27+ memory B cells in their peripheral blood, contrasting with patients with pSS but no lymphoma. Because the expression of CD27 as well as its ligand, CD70, is strictly regulated on normal lymphocytes, it is striking that neoplastic B cells at different stages of B cell differentiation strongly express CD27 [97, 98]. Notably, this included B cell malignancies with a putative origin from antigen-inexperienced B cells, such as mantle-zone lymphomas . In addition, a recent study reported that 7 of 10 high-grade lymphomas from HIV-positive patients and 6 of 10 HIV-negative patients with different lymphomas expressed CD27 . The extent to which these findings indicate a loss of regulation of CD27 expression by the malignant cells and the nature of these abnormalities remain unknown. Potential explanations for the different expression of CD27 by lymphoma might be alterations in the circulation or stimulation of these cells as well as a loss of normal regulatory activity. Importantly, co-expression of both CD27 and CD70 by several tumors indicate that this receptor–ligand pair promote autocrine growth regulation of these lymphomas . It is notable that exceptionally high frequencies of CD27+ (including CD27high) B cells were seen in two patients with pSS and secondary NHL, in contrast with all other patients with pSS (Fig. 1). Although in both cases these lymphomas were putatively derived from later stages of B cell differentiation (immunocytoma and plasmocytoid lymphoma), CD27 expression has been shown in almost all types of B cell NHL potentially associated with pSS [97, 98]. Thus, the observations suggest that significantly enhanced expression of CD27 might serve as an early indicator of the development of an NHL in pSS, a disease with a well-known increased risk for secondary NHL but for which there are no reliable early laboratory parameters. A recent study of a patient with cold agglutinin disease subsequently developing NHL demonstrated that almost all peripheral B cells were CD27+, although not all B cells belonged to the lymphoma . Whether the B cells expressing CD27 in the patients with pSS without lymphoma differ from the cells found in patients with NHL or merely reflect a higher overall activation of B cells in these patients needs to be further examined. Characteristic disturbances of peripheral B cell homeostasis with depletion of memory B cells in the peripheral blood, and evidence for the accumulation and retention of these antigen-experienced B cells in the parotids, together with new findings of the role of chemokines and chemokine receptors, permitted new insight into the immunopathogenesis of pSS. Although most the current data indicate that there is no major molecular abnormality in generating the IgV heavy and light chain repertoire in patients with pSS, influences of disordered selection apparently lead to remarkable differences in V gene usage by B cells in these patients. Most notably, selective influences after encountering (auto)antigen lead to preferential changes in VL gene usage and the length of the CDR3 of VH rearrangements in patients with pSS. One possible explanation is that fine tuning of the antigen-binding pocket is preferentially active on the VH CDR3 and IgVL chains. Overall, concentration and maintenance of B cell activation in the salivary glands of patients with pSS leads to a significant depletion of memory B cells in the peripheral blood, probably resulting in autoantibody production and potential malignant transformation of B lymphocytes in the glands. It will be important to identify factors directing the migration and accumulation of B lymphocytes in order to interrupt the apparent immunopathology in patients with SS. This work was supported by Deutsche Forschungsgemeinschaft Grants Sonderforschungsbereich 421/TP C7, Do 491/4–1, 4–3 and 5–1, and by National Institutes of Health Grant AI 31229.